This weekend hubby and I visited Chincoteague Island NWR. It was a great weekend and we saw some great birds. We left early for Chincoteague on Friday morning and it was a wonderful day almost feeling like a hot summer day. We spent a few hours on the beach and the rest of Friday was spent birding and a hike on the Woodlands Trail. During our dinner it was upsetting to hear that the US Fish and Wildlife service and the National Park Service have plans on changing the public usage and access to Chincoteague NWR and Assateague Island National Seashore. Businesses are worried and I am sure as a visitor I would not like some of the proposed plans. Here is a link Preserve access to Chincoteague to read more about the plans. Hubby enjoys watching the ocean and the waves and I was checking out all the shorebirds and seagulls. The most common bird I saw were the Sanderlings and then the Willets, flocks of Cormorants flying by and lots of Brown Pelicans and of course many seagulls. Sanderlings at 8 inches in length are one of the smallest shorebirds. Sanderlings forage at the water edge and can be seen racing back and forth with the waves. This chubby seagull was bathing in a puddle near the parking lot. There are so many species of Seagulls I have not begun to even try to id them. I do know a few of them by sight like the huge Great Black Backed, Ring-billed and my favorite gull is the Laughing Gull. Chincoteague Island NWR and the Assateague National Seashore is one of my favorite places to visit. The birds are plentiful and it is really cool to see the wild ponies. We were lucky to pick a weekend when the ponies had to be rounded up and penned to be wormed by the vets. Also, it was the 144th birthday of the lighthouse. Soon, I will do some posts on my blog Travel with Eileen about the Chincoteague ponies and the lighthouse. Thanks for stopping by and I hope you enjoyed my post and to see more great posts and photos please visit Our World Tuesday and to see more beautiful birds make sure you visit World Bird Wednesday. Thanks to the host of Our World: Arija, Gattina, Lady Fi, Sandy and Sylvia. Also, thanks to Springman the host of World Bird Wednesday. I hope everyone has a great week and Happy Birding!!!! Great pictures of the shorebirds! I enjoy watching the ocean waves AND seeing the birds! Not just your NWR, but some parks here are threatened to be closed because of budget constraints. This is a fun adventure! Those sanderlings are just like little kids, chasing the water as it rushes to the shore! wow so beautiful. I enjoy looking at the birds, so nice. we love visiting the beach during the fall. the beaches are clean, no crowds, or umbrella's. it's a beautiful, quiet time to visit and photograph all the shorebirds. great shots!! i love those little sanderlings!! Oh gosh - how lovely and relaxing! love that big seagull. and the sanderlings running along are so cute! What a great place, Eileen... I'd love to visit there someday... You certainly know your shorebirds.. I do not---but learn a little from you every time you post a blog like today!!!! Thanks! How fun! And such amazing photos Eileen! Hi Eileen, Nice pictures of your visit to the shoreline. Gee Seagulls are just everywhere, aren't they? I saw a bunch on my recent trip to Yellowstone National Park out on the large Yellowstone Lake. I have even seen a few here on my own backyard 101 acre private community lake in Cumberland County, TN! Who knew that the gulls are so wide-ranging. Of course there are several sub-species. Have a super good day! Very beautiful place to explore and you got some great shots of the birds. I do fear for the future of parks and NWR and heaven knows what else if things continue as they are now here in our country. It's sad and it's scary! Your photos are fantastic, Eileen, love the birds and the beach! Such a lovely peaceful place! I've always wanted to visit Chincoteague Island! Thanks for sharing it with us today! Hope you have a wonderful week! We were fortunate to spend a little time there a year ago on our summer road trip. Just that once and it became a favorite place for us! If we could get there more easily it would certainly be a regular stop. Wonderful pictures and happy memories. Thank you. Sounds like you had a great time! Great photos... I've always wanted to visit there to see the wild horses but now I live on the wrong coast! How great a place must feel, where alike is possible. Great tour of the shore birds!! Boom & Gary of the Vermilon River, Canada. Thank you for these wonderful shots of the birds and the ocean. The video is really impressive with the sounds of the ocean and the birds. Thank you also for your visit, Eileen. Have a great week. Such a nice clean, and empty beach. What luxury. Don't know much about birds, but they seem to be many and varied. An incredible series of beach scenes! I had no idea that there could be such a variety of gulls! Especially in one place! Great photos! Lovely shots. Sometimes I miss the ocean. I always enjoy your birding posts, Eileen! I hope you will always be able to watch for birds at Chincoteague Island NWR. I'm going to check the link you provided NOW! Wonderful shots and nice birding experiencing on the beach. Loved seeing all those birds rushing in and out with the moving waves. I do hope you retain access to this magical place. the beach looks clean, relaxing and inviting. i enjoy all your captures here. Loved the photo of the 3 next to the foamy waters. Beautiful! Another enjoyable post. What is that bird doing soaking in the water? oh what a wonderful world that is! Nice post and pictures, love the shorebirds! Thanks for sharing these delightful captures from your part of our world, Eileen. It really is so wonderful to watch the waves, even the rocks and the beauty is even more magnified if there are birds! Very lovely photos you got there. Unfortunately, i dont see birds in the seashore near our place. thanks for sharing the video Eileen...so refreshing...I miss the beach...love all the photo...thanks for the visit. I can watch these guys all day long! Loved going through your photos! What a wonderful place to visit! Oh Eileen, I hope they don't limit access, because I want to go there! I have been waiting my whole life to see the ponies! I can't wait to read your post about them! We saw a bunch of sanderlings out on Plum island this past weekend. I hope to get my photos posted soon. They are such cute birds! I love those Willets Eileen, very unique wings in flight and one of the US waders that unfortunately don't get blown over here after Irene and Katia. Wow..discouraging. Though I didn't click the link to the town's responce I hope something will work out. Those present many changes! Indeed, a calm and relaxing spot. I especially like your header! I really like the new header... a lovely picture. Great sea-side photos. Interesting birds. Sanderlings we have down here as well but not Willett and of course the gulls are different. those are very cute pictures of willets in flight, love seeing them, they seem to walk so graciously and happily as well. You just can't beat photos such as these!!! I love it!! Beautiful video, pictures. I never have seen the Willets before, thanks Eileen. Loved the video! It gave me such a ocean rush. 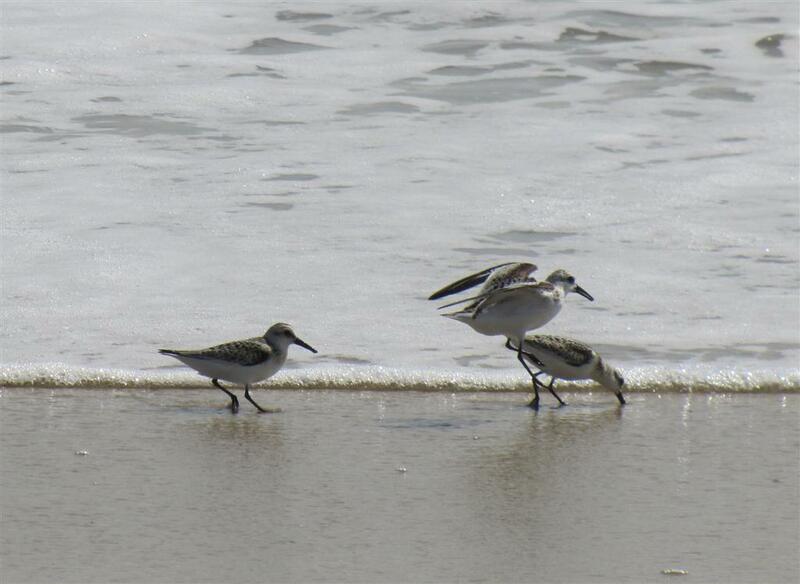 And how much fun to see the shore birds scampering back and forth in the surf. Just awesome Eileen! Beautiful post, Eileen. I love your header photo. Enchanting video! Reminds me of our visit to Chincoteague many years ago. Would love to go back there. By the way, that fat gull picture is priceless! such lovely little birds!! great shots...especially the 'in flight' ones...they're hard to get!! for me, anyway! Sorry for my long break in visiting your wonderful blog! Eileen, I loved the video. It made me homesick for the ocean as I use to live on the eastern coast. Hope nothing harsh changes for the birders and nature lovers. Oh my gosh, I love the seagull in the puddle! thanks for the video. That is a tbehaviour I have not seen. Looks fun when they run in and out as the waves go. Another set of lovely pics! The beach never grows old.